Specially processed MP3 files are used to play within the Palace for Windows. In order to play them, users must have a special audio decoder installed. This page shows you how to determine if you have the decoder and how to install it if you don't. The Current version (3.5) of the Palace client for Windows will not play normal MP3 files. MP3 files must look to the Palace as though they are WAV files. To accomplish this, Studio Dust uses MP3 files that have been processed to have a RIFF (Resource Interchange File Format) header indicating that they are WAV files. Note: the Windows Palace Client is limited to playing just a little more than 1 megabyte of sound data. MP3 files that are longer than that will cut off before the end. However these files will play in their entirety when played using most normal MP3 players. 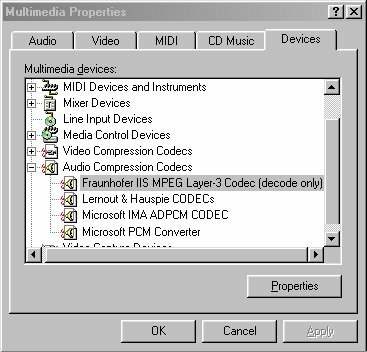 The special audio decoder required to play MP3 files is the Fraunhofer IIS MPEG Layer-3 Codec. 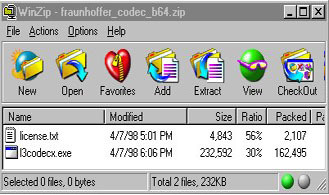 This codec is usable on Windows98, Windows95 and WindowsNT. For more information about the organization responsible for the codec and the MPEG-Layer 3 specification, visit the Fraunhofer IIS WEB Site. Do You Already Have the Fraunhofer Codec? First, let's determine if you already have the latest version of this codec installed. To find out, open the Mulitmedia control panel. Click the Start menu, select Settings then Control Panel. In the Control Panel window, you should see the Multimedia Control Panel icon like the one shown above. Double click that icon to open the Multimendia Properties window. Then select the Devices tab (or Advanced on Windows95). The view will to change to resemble the one shown below. Click on the + sign next to Audio Compression Codecs to view the codecs installed in your system. 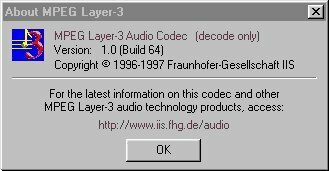 Amonst the codecs you see, if you do not see one named FraunhoferIIS MPEG Layer-3 Codec (like the one highlighted above) then skip down to "Install the Fraunhofer Codec". Highlight the FraunhoferIIS MPEG Layer-3 Codec, as shown above, and click the Properties button. In the new window that opens click the About button to reveal the verison information as shown below. If the version and build shown for your codec are the same as or higher than shown in the picture, above, then you need go no further (or is it farther?). Your system should be ready to play the special MP3 files with RIFF headers from the Palace client. The installer for the code is available here in a ZIP archive. In order to extract the file you will need a program to handle ZIP archives. If you don't have one you could get Winzip or Stuffit Expander or PKzip. Download the ZIP file saving it where you will remember to find it. Once you have the file on your computer, open it with your ZIP program and extract the files, license.txt and l3codecx.exe. If you open the ZIP file with Winzip you should see a window that resembles the one below. In this window you can double-click l3codecx.exe to install the codec. Or you can extract the file first and then run it. When you run the installer, answer "Yes" to continue, read the license agreement and answer "Yes" to install the codec. After a few gyrations, the installation should be complete. You should then re-check the Multimedia properties as described above to verify that the codec was installed.